OUR PRICE: $60.48 - Join Rewards Get $3 Dance Dollars On This Item! Make a statement with effortlessly fashion-forward pieces brought to you by Chelsea B. 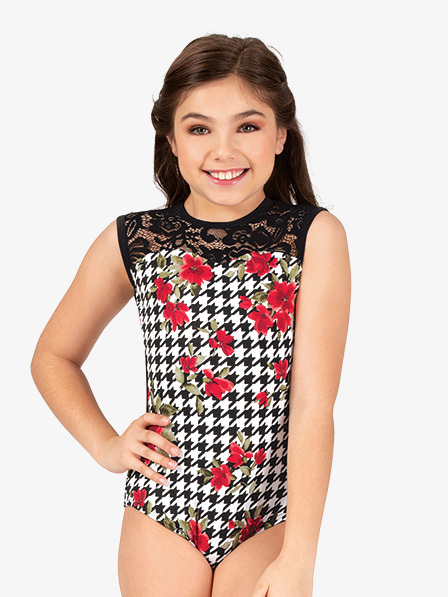 Get all the attention in this fun dual printed leotard - featuring tank sleeves, a lace upper bodice insert, sweetheart bodice, full front lining, neck closure, lace back insert, open back, and houndstooth flower printed fabric that's soft to the touch.